Making a decision to leave the team that drafted you after nearly a decade is never an easy one and there's so much that goes into such a massive decision. It was morning in Mississauga, maybe 10 a.m., when it hit me. I was in the backyard by the pool with my fiancée, Aryne. The whole morning, I’d been out there, just wandering around, in this cloud of my own thoughts — almost like a nervous kid backstage before a school play, trying to keep track of his lines. Just pacing and thinking, pacing and thinking, for hours. Going over everything … again and again. And then suddenly I lost it. I’m not trying to sound dramatic — that’s just actually what happened. I just sort of …. lost it, you know? I collapsed onto the couch that we have out near the pool. And I just started lying there, becoming more and more overwhelmed. Not even thinking, really, but more like … whatever comes after thinking. I was panicked. I felt frozen. Because it was at that moment, I think, that it finally just hit me. It finally just hit me that I’d taken all the meetings. I’d weighed out all the pros and cons. I’d had all of the conversations with family and friends. It hit me that I’d slept on it … showered on it … eaten on it … flown across the country on it … and now I’d paced around the pool on it more times than I could count. It hit me, in other words, that I had done everything there was to do except make a decision. I don’t even mean that I couldn’t decide — because I think at some point that morning, I had decided. Deep down, I think I’d come to realize where I was going to play hockey next season. But there’s deciding … and then there’s making a decision. And it was that very last part that — man. For some reason, I just literally, physically could not do it. Which is how I wound up on the couch, in our backyard, asking my fiancée if I was having a breakdown. Fortunately Aryne is amazing, and understanding, and was there to listen and help me trust what my instincts were telling me — and eventually I was able to figure things out. I wasn’t losing it. I wasn’t having a breakdown. I was just in the middle of what was a truly life-changing decision. I was being pulled in two opposite directions, by two powerful forces — both of them incredibly close to my heart. The first force, you’ve probably heard about. It’s the one bringing me back home: I’ve signed a long-term contract to play for the Leafs. As an Ontario kid, there’s just no two ways about it — this really has been a childhood dream. But it’s the second force pulling on me that I can’t seem to shake — and it’s the reason why I wanted to write this letter: my real, honest, still-there love for the New York Islanders hockey franchise. And my not wanting to leave. As we all now know, Tavares signed with his hometown team, the Toronto Maple Leafs, in order to realize a childhood dream, but as you can see his decision to leave Long Island was from easy and predetermined. In his emotional Players' Tribune piece, Tavares also apologized to the "Islanders Faithful" for not winning a Stanley Cup during his time there. I want to apologize, from the bottom of my heart, for things not working out — and for the fact that, under my captaincy, we fell short of our ultimate goal. But I gave it all that I had … and I can’t tell you how grateful I am for how you gave me all that you had in return. 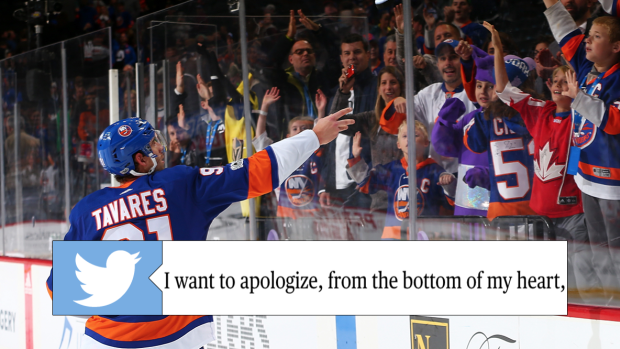 Isles fans … thanks for reading, thanks for caring. We know there are more than a few Islanders fans that will be upset about Tavares leaving for a long, long time, but he gave it his all for that franchise and now he has the opportunity to live out his childhood dream in Toronto.